The title “Bubbles” emphasizes the transparent sphere as a universal way of consumption. It appears in many ads and also serves as a draft or as a decoration for wrappings. 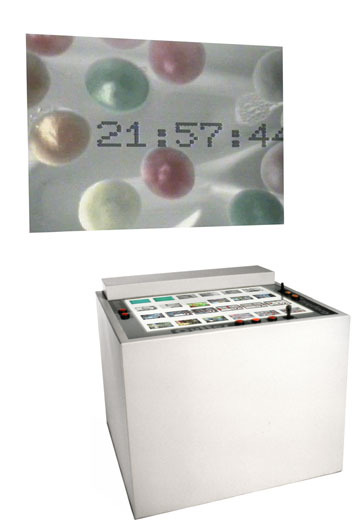 In this video installation the bubbles of the consumer industry are separated from their products and are at the disposal of the visitor as visual toys. With the use of the computer keys and joysticks a group of people can create a new video program together by using the collection of toys. This interactive process causes a short-circuit of the mechanisms between consumers and producers. The users of the installation become creators of the “Bubbles-Channel”, they actually create a video program. They choose from appealing moments of ads. Wrapping design and ads are designed by the industry to communicate with the consumers and to allure them to buy their products. The answer of the consumers by analyzing the form of the demand influences indirectly the design of advertising. The “Bubbles-Chanal” shows a mix of videos of consumers, uninfluenced by materialized items, production and money. The neutrally designed operating desk ensures that the “Bubbles” don´t influence the audience. The visitor may arrange due to his/her social code the appropriate images and therefore allures a like-minded group of people, in the moment when the specifically designed program appears on the monitor, making it easier to communicate at the object. However, all users run into errors, like breaks. Following the principle of “anything goes”, the encompassing fascination comes only up by unconventional mixtures of lifestyle images, carefully sorted by advertisement strategist. The installation intents to produce a new audience, an audience willing to not just to go and consume media already produced for a specific audience, but to use media as a tool for a more individual expression. It´s about the changed perception of the contents of media and, moreover, the sensitization for interactive structures of organization of the most different medias.